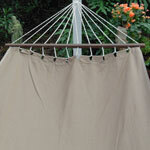 Cozy outdoor hammock chairs make perfect additions to any garden or home. Sit back with your favorite book or cup of joe and sink into the comforts of luxury with our newest Chocolate Fabric swing chairs. Select a decorative pillow with flowers, or possibly one of the flamingo or heron birds. Either way, you are going to love this new special swing seat! 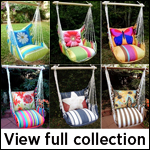 View our most popular combinations of outdoor hammock chairs and pillows below. The bottom & back pillows ARE NOT sewn in, so you can purchase extra 19" x 24" pillows to swap into the chair and give it an entirely new look as often as you like. If you prefer a back pillow not displayed below, simply give us a call and tell us the fabric and pillow combination you desire!